With an adventurous clientele in mind, a new company has hopped on the challenge of creating home décor that pulls the outdoors inside. Treeline Designs, LLC has officially launched its functional bicycle art business with a fresh new take on home furnishings. 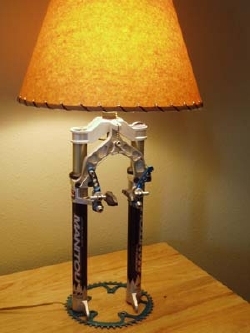 Offering specialty lamps made from recycled bicycle components- specifically used suspension forks- Treeline Designs captures the bike enthusiast's spirit and turns heads. Invented nearly ten years ago in the garage of their family's Indiana home, brothers Nick and Kris Lasure began designing unique lamps featuring bases furbished with anything from chain rings to disc brake rotors. Now handcrafted in Boulder, CO, designer Nick Lasure turns to local bicycle shops for salvaged parts. Using standard electrically-rated workings and accessories, the on/off operations range from simple twist switches to a unique internal switch inside the suspension fork. Each innovative piece will typically run $100- $300, depending on complexity, materials and artistic value. More involved designs can reach $500. Commissioned designs featuring a customer's own parts are also available for a flat fee. Treeline's original designs are available for purchase at treeline-designs.com, with future plans for retail at local businesses. For more information or specific requests, please check out the website (www.treeline-desings.com), e-mail Treeline at lamps@treeline-designs.com or call 303.859.4889.